Buenos dias lovelies, hope you had a fab weekend. It was pretty low key around here. Pretty much just running errands and lounging at home. For days like these I like a "one and done outfit". I got this Vintage Wash Denim dress from mark. By avon and it's been a great piece to throw on and instantly be ready to walk the dogs, go to the post, or the grocery store. I might not look as darling as the model below but it is hot here in LA people! I love it with the sandals but I gave mine more of a sporty vibe with my vans. 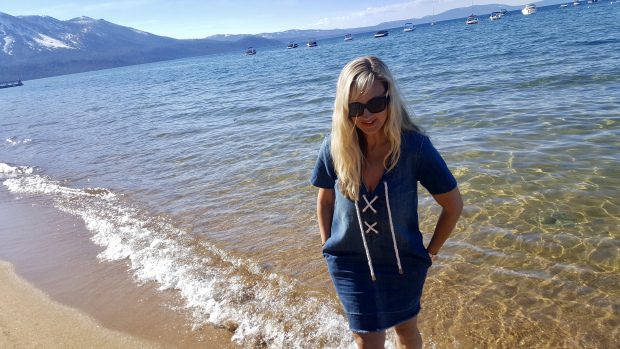 Chambray dresses are a nice option for summer and the lace up trend is everywhere. Fellow blogger Alicia from Word of Alicia took hers to the lake. This time of year calls for easy pieces that can travel and are versatile. What does your one and done piece look like?